If you like to have a special wallpaper on your Desktop, Galaxy tablet, iPad or iPhone you can check out the APEX rocks wallpapers. Red Gate created in conjunction with APEX Evangelists the APEX Rocks set especially for the APEX community. There are other sets available from the Red Gate website. The APEX Rocks set wallpapers can be downloaded from APEXBlogs. On the right hand side under Useful Tools you find the link. Although they are not specifically listed in the New Features overview, Oracle APEX 4.1 seems to include some charts enhancements and bug fixes. Here's an overview of the improvements I found on 4.1.0.00.03 compared to 4.0.2.00.07. 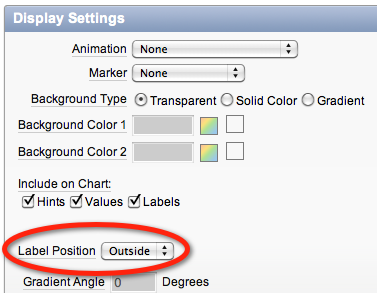 1) Although the Font Settings was there in APEX 4.0, there was not a region display selector for it. That got added now. 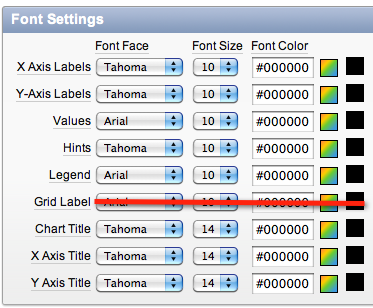 2) In the Font Settings the Grid Label was removed. 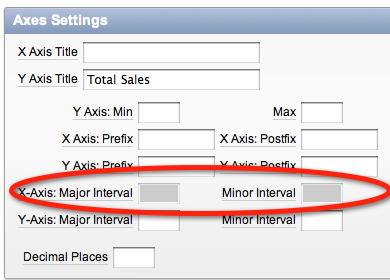 This setting was a carry over of APEX 3.x but became obsolete in APEX 4.0 (more info in this blog post's comment). 4) Two new features for Bar and Column charts: Overlay Y-Axis and Sorted Overlay Y-Axis which allows to see the Series behind each other instead of next to each other. 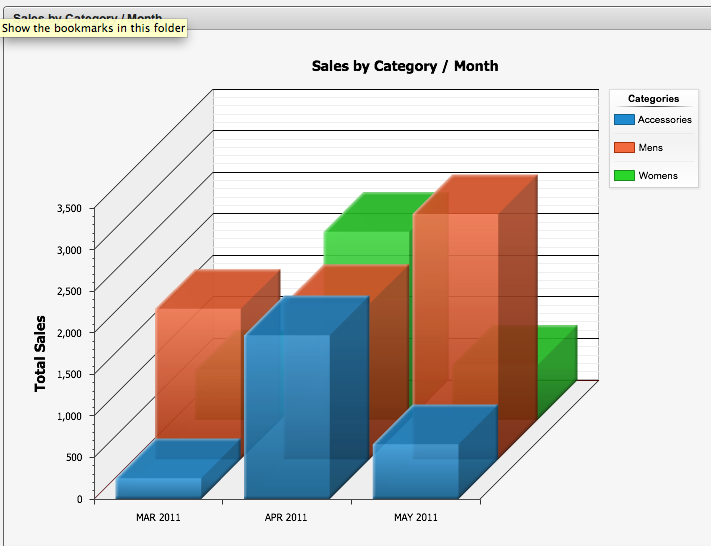 Normal behaviour of a 3D Column chart with three series. 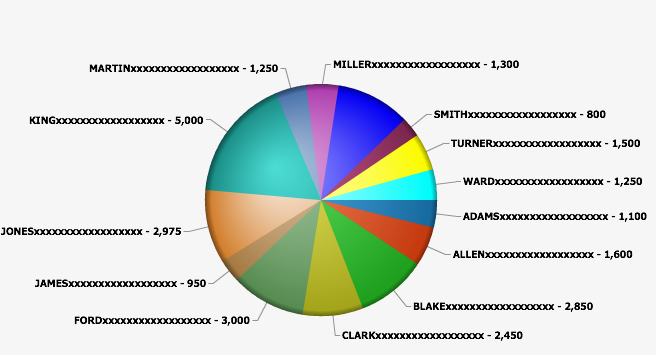 If the Overlay Y-Axis is checked the Series go behind each other. The Sorted Overlay Y-Axis is especially useful in a 2D Column chart, as if you wouldn't do it one column/bar might be over the other one and you wouldn't see it. If it's sorted the smallest are in front and the biggest columns are at the back. In the above example the green (Womens Series) is behind the red (Mens Series), but as they are a bit transparent and 3D you still see it. 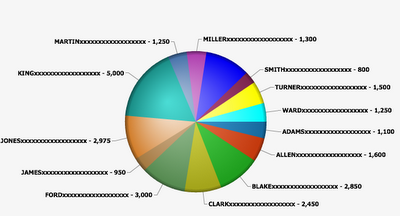 If you prefer to see it better you should use the Sorted Overlay Y-Axis too. 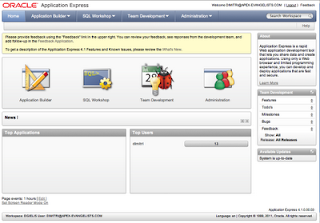 5) The overall feel of the Application Builder was improved in APEX 4.1. 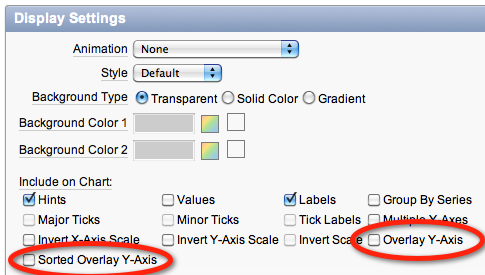 The Axes Settings for example now disable some fields depending other selections on the page. 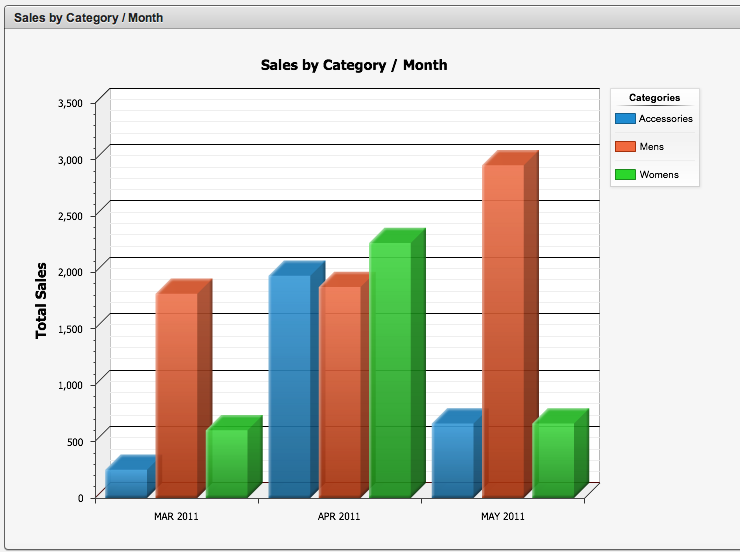 Also only the features that are useful for the chart you selected should be visible. 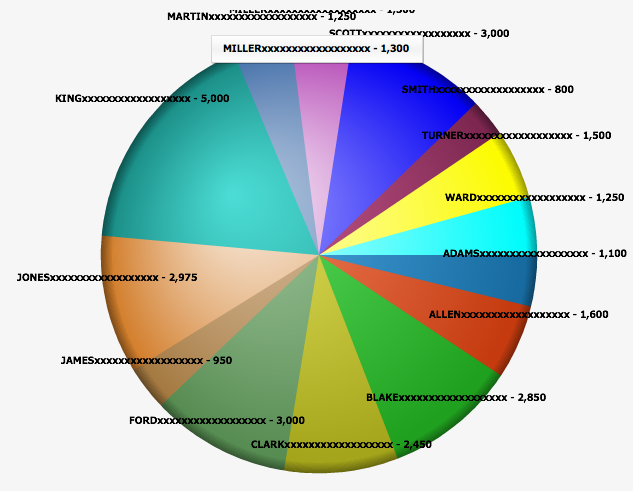 7) You can now position the label of a Pie or Doughnut chart to be either outside (default) or inside. Lengthy labels made the size of the chart smaller as the label was on the outside. If you put your label on the inside you don't have this anymore. It's these small tweaks that make APEX even better than it was before and makes it a great development environment. 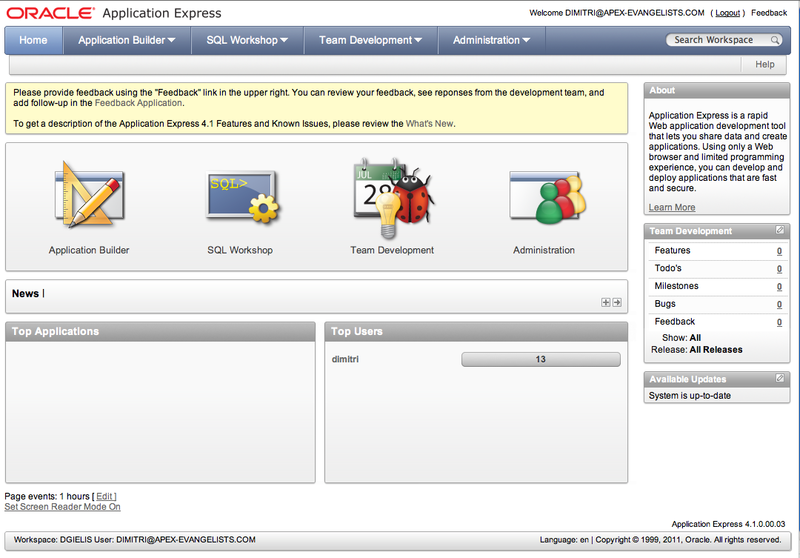 10 days ago the APEX Development team announced an early adopter version of APEX 4.1. Although APEX 4.1 is not as big of a release as 4.0 was, it will definitely be worthwhile to upgrade once it becomes available. A list of the new features you find here. I've seen a demo of the upcoming Mobile Support before and if that was already in this build of APEX 4.1 it would have been in my top list as well. Another powerful feature mentioned in the SOD will be Data Upload, that enables end-users to upload data into an existing table. 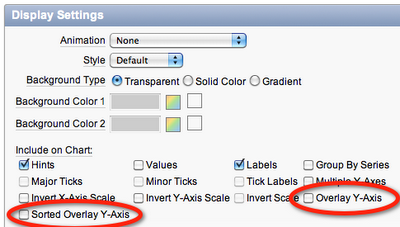 One feature that was rumoured to be in APEX 4.1, but seems not to have made it in time, is non-flash charts. (on a side note; I don't mind that, as we (APEX Evangelists) offer a non-flash chart plugin for APEX :-)). Definitely give APEX 4.1 a try yourself and give as much feedback as possible to the APEX Development team (from the APP Builder there is a link to the Feedback app). If you want to read more about the new Error Handling features in APEX, Patrick Wolf did two blog posts which give more detail: part 1 and part 2. If you are interested in reading about the new Authorization scheme plugin, check out the post of Christian Neumueller, another member of the APEX Development team who started to blog recently. Oracle and OBUG APEX SIG are glad to invite you to a free full day APEX seminar. The agenda has been completely filled and we have some of the most recognized APEX people presenting!